In 1859, the De La Salle Christian Brothers founded St. Michael’s College, which became the College of Santa Fe in 1966. 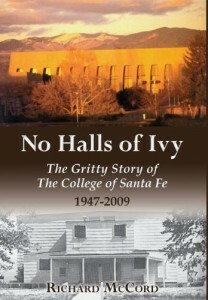 It is the subject of the new book published by the Brothers, No Halls of Ivy: The Gritty Story of the College of Santa Fe 1947-2009 by Richard McCord. This book traces the history of the school from 1859 when its founders arrived after months of traveling by ship across the Atlantic Ocean, to becoming the first institution of higher learning chartered by the New Mexico Territorial Legislature in 1874, and through the ups and downs in the years ahead. No Halls of Ivy chronicles the history of the school through 2009. The book is available on Amazon and through other retailers.